Hello, friends! I hope that today finds you all doing well and feeling okay lately! Myrtle Beach’s “Broadway at the Beach” has a restaurant called Margaritaville which offered an extensive gluten-free menu. Having Celiac Disease, the prospect of enjoying a gluten-free hamburger on an actual BUN with actual FRENCH FRIES with a BEER at a “real” restaurant like a “normal” person excited me greatly. 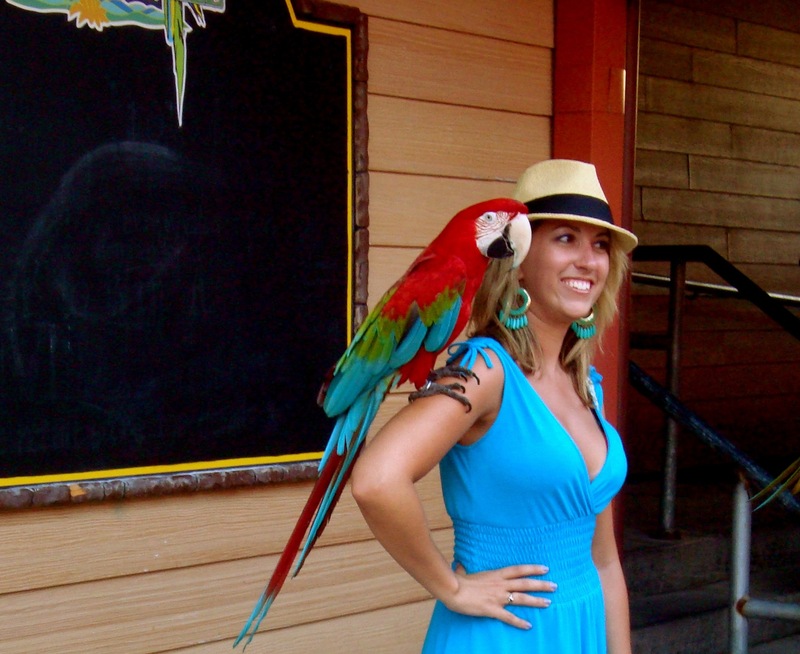 So, despite grumblings from the rest of my crew, it was so worth the 3-hour wait….and I got my photo taken with an exotic parrot on my arm to boot – pretty cool, if I do say so myself. On vacation, I also decided, too, that I’m trying this new thing, too, where I try to be logical about my shoe choice. If any of you have read my past blogs where I have been ignoring my doctors for years now about the idiocy of my wearing stilettos and pumps given my knee and back situation, then you know that I have somewhat of an unhealthy shoe obsession. (Hey, what can I say? I love high heels, and fashion, and dangerously cute shoes – and I do mean dangerous in a literal sense here!) So, while on vacation, I explored the world of unique – yet cute – flats. 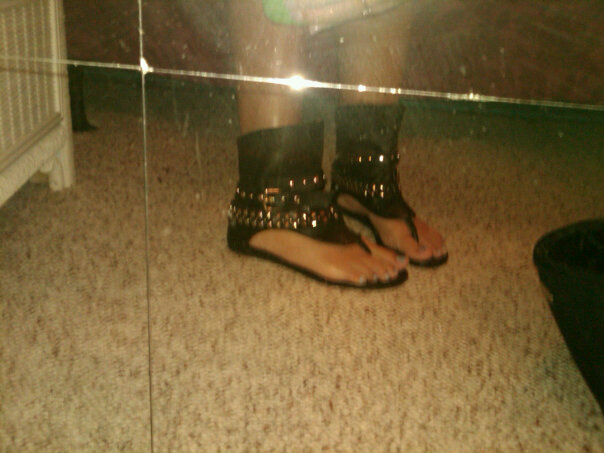 I figure that during the summer, I can find flattering and cute sandals. My problem will come, however, when summer is over and I have to wear flats that are NOT so “open” and forgiving. That is when I may have to revert back to my heel-wearing habit. I’ve had friends on my Arthritis Ashley Facebook page, and my family members, and my boyfriend, trying to talk some sense into me. However, this is one instance in my life where logic isn’t winning. NO. I do NOT want to end up in a wheelchair because of a shoe fetish that would rival Carrie Bradshaw’s. YES. I know that I am causing myself more pain than necessary. But, come on – I’m not rocking some Lady Gaga platforms here. The shoes I’m wearing aren’t outrageous. They’re just cute shoes that any of my ‘healthy’ (well-dressed) friends would be wearing. The way that my mind is working, though? I am in sick/pain anyway if I’m wearing flats, slippers, no shoes, or six-inch heels. I assume that I’d be in some form of pain if I’d be wearing stilts. Sometimes, I’m in pain when I’m sleeping. Sometimes, I’m in pain even if I take pain medication. So, it may be a sour attitude to have, but, when sacrificing so much already, why should I sacrifice my shoes? How much of a difference is it going to make? Where do we, as patients with arthritis and/or other chronic illnesses, draw the line? I mean, I understand that we have to be proactive patients who are on top of our health at all times. Naturally, we don’t want to do anything that’s going to be TOO detrimental to our health. We want to improve our quality of life, we want to increase our life span, we want to make sure that we are comfortable and taken care of, and taking our medications properly, going to all of our treatments and doctor appointments, and being responsible and accountable for our own health because we want to get better. I do all of these things. Life is short. We have to be happy, too. Life is about moderation, also. You have to weigh importance of things and sometimes, make sacrifices in order for your own happiness. However, I have some other “food allergies” that are not, by any means, deadly, or all that severe. Garlic is one of the many. So, if I want to order a gluten-free pizza, then, yes, it better be gluten-free, but, if there is garlic in the sauce, I’m not going to deprive myself of that pizza, because there may be a touch of garlic in the sauce, or garlic seasoning, etc. Mind you, if the garlic was going to send me into anaphylactic shock or give me any serious or long-term reaction, well, that would be a different story. You have to know your limits, know your boundaries, know the consequences of your decisions, and know your own body and what makes you tick. No, I don’t. I don’t because I see people get hooked on them. I don’t because I see people get drugged up and go through the day in a fog, seeming like a zombie. I personally don’t like any medications that worsens my “brain fog” or puts me in a haze. That’s just my OWN personal choice, and every drug affects every person differently, so I don’t “hate on” anyone that takes it. I say to each their own – that’s just me. So, yes, at times I am suffering in extreme pain and it is a sacrifice not to take the pain medication. I realize that, and you may think that it is a dumb choice – just as it may be a dumb choice to eat garlic when I’m allergic to it, or wear high heels when it worsens my already-bad knees and back. But – isn’t life all about making choices and, sometimes, making certain sacrifices to make yourself happy? The way that I look at it, is that I’ve already given up a lot because of these conditions. I’ve given up sports, friendships, a career in teaching, working full-time in general, the body that I would like to have, the lifestyle that I would like to have, and many, many, many foods due to a lot of dietary restrictions due to food allergies and intolerances, the Celiac disease, and now, GERD. When I was on vacation, I decided this: I’m not going to give up wearing heels 100% – but I AM going to try to become accustomed to wearing flats more frequently and to make my mark by finding really unique ones. (see right) I’ll wear the heels in moderation. While I was down there, I also decided that I’m going to try to continue to just live life to the fullest and stop dwelling on the “what could have been”. At one point, I got “down” because I saw how “fit” and “athletic” / “in-shape” looking that “other” people in their 20’s were. Obviously, I wasn’t one of them, and I was wishing that was me, and thinking that it would have been IF I hadn’t had these conditions. Sure, that was most likely the truth. Sure, I’m small and petite. However, having chronic illness, gaining weight and being bloated from medications, and then, on top of that, barely being to work out ever if at all, does NOTHING for your (once cute) body. I can still wear a bikini. But, I’m not in shape at all (not by any means – but at least I know how to fake it for photos – LOL!) and I was wearing a cover-up a lot and sitting under the umbrealla. The point is, I began to realize I had no reason to feel self-conscious. I will, hopefully, some day, be able to get back into the gym, or some type of more consistent exercise routine. After all – exercise is THE BEST medicine for arthritis! Now….in other news … I met with a counselor who diagnosed me with anxiety. He thinks that it is ‘reactive anxiety’ in direct relation to my chronic illnesses. Do any of you have anxiety in relation to your arthritis or other conditions? He also wants me to try Biofeedback for pain management. Have any of you tried biofeedback, and what do you think? If you have, please leave a comment, and share your story! In the meantime, I’d like to continue walking and swimming, and start yoga classes back up again! Over vacation, I did a lot of walking, some swimming, and played some Par-3 golf with my boyfriend and mini-golf with him and my parents. What types of exercises have you done lately? My favorite is just taking walks with my dog or my boyfriend! Well .. I must go. Time to pack for a long weekend in Florida! Please share your comments and, if you like this blog, feel free to Subscribe via email and/or share with your friends! Tags: anxiety, anxiety chronic illness, anxiety disorder, Arthritis, Arthritis Blog, Arthritis Foundation, Ashley Boynes, Autoimmune, autoimmune arthritis, Autoimmune Condition, autoimmune disease, biofeedback, Blog, Celiac Disease, Chronic Disease, Chronic Illness, depression, food allergies, generalized anxiety disorder, GERD, gluten free, Health, Human Body, inspiring story, Invisible Illness, JA, Journey to Wellness, JRA, Juvenile Arthritis, Methotrexate, Mid Atlantic AF, Mid Atlantic Region, Migraines, Myrtle Beach, OA, Osteoarthritis, pain management, positive thinking, positivity chronic illness, RA, reactive anxiety, reflux, Rheumatoid Arthritis, Sacrifices, shoes, Spoonie, Spoonies, Wellness, Wellness with a Side of Life Please. Bookmark the permalink. I like your attitude, Ashley. Can’t think of what might’ve been, because it isn’t. It is today, gotta live the best you can, in the style you want, with the pain limitations. Good for you re the bikini, and everything else. Wish I had that attitude when I was in my 20s, but was too cautious! I regret that, but now I’m freer. Your article is a good way to teach others to go for the gusto! As for shoes, though: I developed bunions b/c of the heel and stylish shoes, so now wear flats. Find them more comfortable, but not stylish. I don’t really care (I’m 59) as much as others, but I do like to look at shoes! Keep up the good styles–maybe you’ll develop your own line! Great blog as always! Did biofeedback for awhile…there were some things that actually made me feel more tense! Although, I did pick up some techniques that I find helpful when I am in a lot of pain, as well as when I am completely overwhelmed with dealing with chronic health problems and all the appointments that go with! i love the way you express yourself ashley and i hear you about how our choices reflect what we really value in life. i so get loving your heels – i remember loving mine too when i was your age. i find meditation helps me most with my pain and try and incorporate it everyday. helps a lot. i share your position on pain meds – don’t need anything that increases brain fog and would rather be uncomfortable than take heavy duty stuff, and also no judgment for anyone who choose pain meds instead. it’s so important that we not judge each other for the individual choices that we make that show what we value most.